The Neckinger joins the Thames via St Saviour’s Dock (once sarcastically nicknamed Savory Dock due to the purification there) & continued via Bermondsey Abbey (which was in the land now covered by Bermondsey Square), through the Elephant & Castle area and finishing up behind what is now the Imperial War Museum. The river’s name is believed to derive from the term ‘Devil’s neckcloth’ - a slang term for the hangman’s noose. A neckercher is an old word for a cravat or other covering of the neck. Until the 18th century, Thames pirates were executed near the mouth of the inlet. The corpses were placed on display as a deterrent further downstream on the Thames. 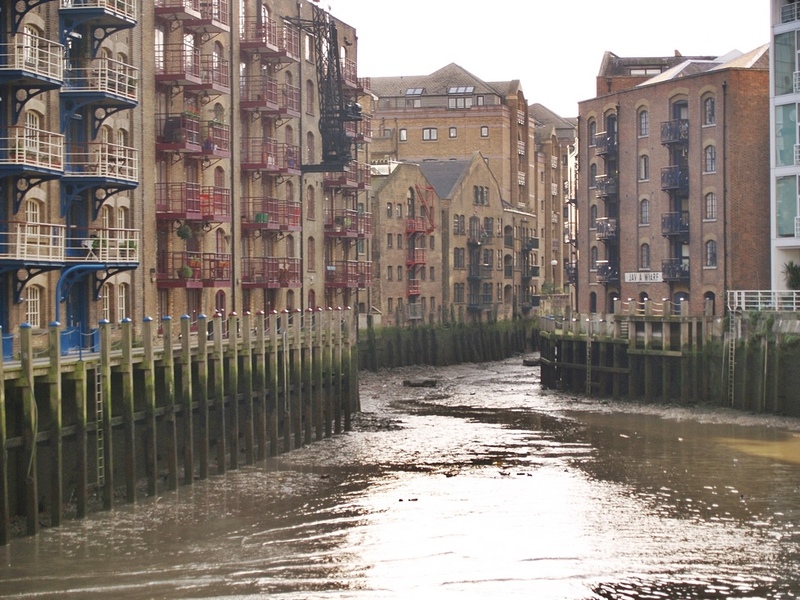 St Saviour's Dock was created in the 13th century by the monks of Bermondsey Abbey (founded 1082, ¾ mile to the south-west) who enlarged and embanked the Neckinger inlet, naming the dock after the abbey's patron, and built and ran a windmill on its bank, The Mill of St Saviour. Around 1536 (after the dissolution of the monasteries) the windmill was converted into a water mill to supply local inhabitants with water. It later became the first gunpowder factory in England to be powered by water, and later still it was rebuilt as a paper mill, becoming one of the first mills in England to make paper from straw. By Dickens' time, lead mills occupied the site. The area at St Saviour's Dock was later known as Jacob's Island this man-made "island" was created in the 17th Century when the tidal ditches surrounding and intersecting the island were dug around the Neckinger. The largest of these was called “Folly Ditch” which is where Mill Street is now located. The area was once notoriously squalid and described as "The very capital of cholera" and "The Venice of drains" by the Morning Chronicle of 1849 which went on to say 'The water is covered with a scum almost like a cobweb, and prismatic with grease. In it float large masses of green rotting weed, and against the posts of the bridges are swollen carcasses of dead animals, almost bursting with the gases of putrefaction. Along its shores are heaps of indescribable filth, the phosphoretted smell from which tells you of the rotting fish there, while the oyster shells are like pieces of slate from their coating of mud and filth. In some parts the fluid is almost as red as blood from the colouring matter that pours into it from the reeking leather-dressers' close by.”The environs are also vividly described in Charles Dickens' novel, Oliver Twist. Fagins Den was set in one of the warehouses and one of Dickens' best-known characters, Bill Sykes, meets a violent death in the mud of St Saviour's Dock. The watercourses provided a water supply for tanneries (ever since the Middle Ages Bermondsey was one of the main places in England for the manufacture of leather) and factories as the area was developed, and prepared the ground for large-scale building - Bermondsey was originally marshland. Soil excavated from the ditches was used to embank and raise the level of the adjacent ground to provide firm, dry foundations. The whole network of watercourses acted as an extended mill pond. Most of the early buildings of Jacobs Island were demolished by 1860 and replaced by Victorian buildings many of which have also gone though New Concordia Wharf & St Saviours Wharf still survive. The 1968 film Oliver! was filmed at New Concordia Wharf and in the opening scenes of 1999’s The World is Not Enough, James Bond’s speed boat traverses the length of St Saviour’s Dock. Modern day St Saviour’s Dock remains intact in somewhat more desirable environs than Dicken’s days but beyond that the river is now totally enclosed and runs underground. 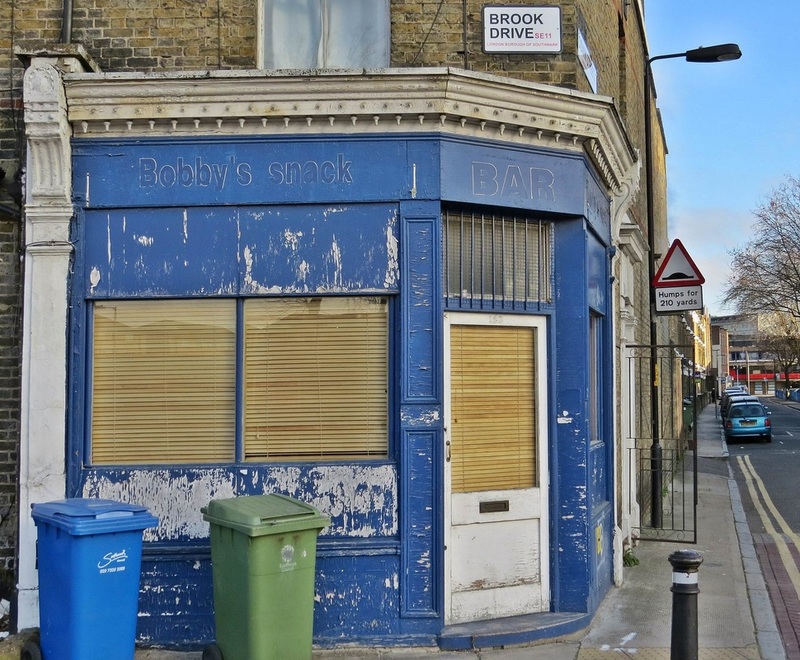 Bermondsey’s street & pub names are constant reminders of the leather industry. 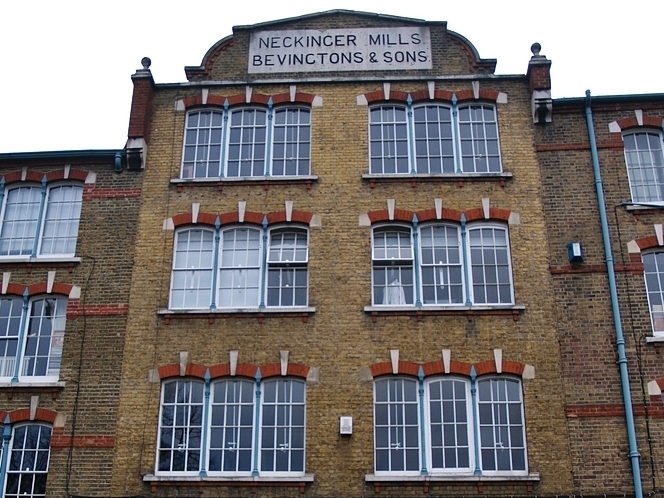 One of the oldest and most important firms who started leather manufacturing in Bermondsey in 1800 at Neckinger Mills was Bevingtons which only moved out in 1981 and the building still stands.